Bloops! In our Microsoft peripheral coverage yesterday we forgot to mention the most glorious peripheral for avid PC users. 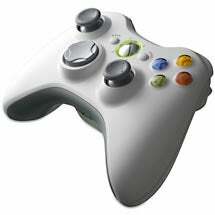 A USB wireless receiver for all Xbox 360 wireless peripherals. So yes, you can finally use the wireless controller, the upcoming wireless force feedback steering wheel and even the wireless headset with USB goodness. This will be out this "holiday season"—which has been the most popular phrase by Microsoft reps so far. Sorry for the lack of pictures, blame Microsoft for not having the product or any pictures. Get more after the jump. Rookie Gizmodoian, Jason, also drilled a Microsoft marketing rep about if the HD DVD player for the Xbox 360 will be compatible with the PC. The response: "TBD"—this happened to be the second most popular phrase by Microsoft Reps. So maybe there is some hope for the HD DVD player being cross compatible. Also we had a sit down regarding the Live Anywhere functionality that will allow Xbox Live to function over mobile phones, PCs and the Xbox 360. It is reported that the mobile Xbox Live function will begin with phones running on Windows Mobile 5, but they are trying to reach out to other cellphone manufacturers to incorporate Xbox Live into all phones. Lastly, the mobile phone connectivity mentioned in the press event yesterday had some misleading information. They said that you could download content to your Xbox 360 via the mobile phone. This is stretching the truth. Unless you have your Xbox 360 on all the time, the feature only queues up a download and it will actually start once the Xbox 360 is turned on, so yes, you still have to wait while the massive files are downloaded. Bummer. One other thing about Live Anywhere functionality is that it's right now only compatible with Windows Vista. We asked if Windows XP support was going to be put in, but got hit with yet another TBD.